A particuarly handsome apple, thought to be one of the parents of Cox's Orange Pippin. It has some of the aromatic qualities of that variety when eaten fresh, but is noticeably sharper in flavour - and for this reason is often used in the kitchen as well. By Victorian times Ribston Pippin was very popular as a late autumn apple, and the Victorian fruit enthusiast Robert Hogg reported that it was in "greatest perfection during November and December". Please fill in the details below and we will let you know when Ribston Pippin apple trees are back in stock. Use / keeping: 1-2 months? Ribston Pippin is in flowering group 3. 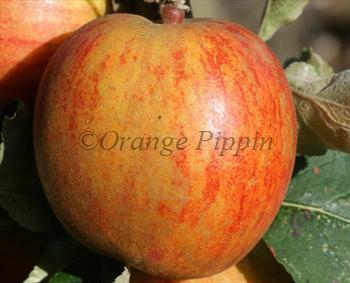 Ribston Pippin is a triploid variety and cannot pollinate other varieties. It needs to be pollinated by another tree of a different variety nearby. You can either plant a self-fertile variety (which will pollinate itself and the Ribston Pippin) or you can plant two pollination partners which must each be of different varieties and able to cross-pollinate each other as well as the Ribston Pippin. If you need further advice on this just get in touch. Since it flowers in the middle of the blossom season it can be pollinated by most other apple trees. Ribston Pippin is a tough tree, suitable for growing throughout England and much of Scotland - but it needs a sheltered situation in more northerly gardens and it prefers a drier climate than a wet one if possible. Named after Ribston Hall in North Yorkshire, England, where this variety was first planted in the 18th century. Having been grown in Yorkshire for more than 200 years Ribston Pippin is rightly regarded as a traditional Yorkshire variety, however it was almost certainly brought to Ribston Hall from France.